Transport them to picturesque Tuscany with the gourmet tastes inside this Italian Gift Basket. Comprised of authentic, award-winning Italian foods like organic pasta, zesty sundried tomato bruschetta, puttanesca pasta sauce made from vine-ripened tomatoes, and Tuscan crisps, this exquisite gift offers a sweet escape to the Italian countryside. This best selling Italian Gift Basket delivers an authentic taste of Tuscany complete with all your Italian favorites, exclusively from GourmetGiftBaskets.com! Gourmet foods include chiocciole pasta shells, authentic puttanesca pasta sauce, marinated artichoke hearts, sundried tomato bruschetta, cracked pepper Tuscan crisps, arborio rice, and tiramisu wafer rolls! 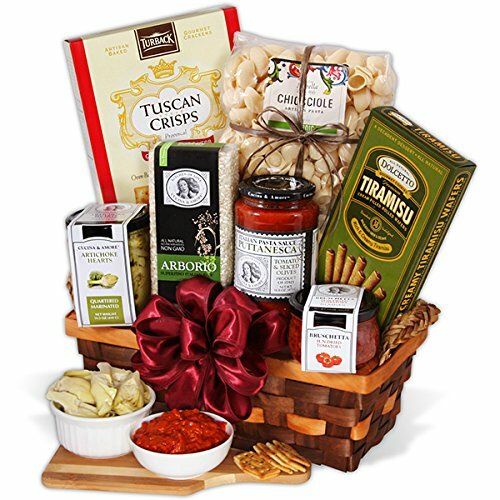 Keepsake woven basket with Italian foods is professionally shrink wrapped with a festive ribbon. 100% Satisfaction Guarantee for you and your recipient only from seller GourmetGiftBaskets.com! View More In Sauce, Gravy & Marinade Gifts. If you have any questions about this product by GourmetGiftBaskets.com, contact us by completing and submitting the form below. If you are looking for a specif part number, please include it with your message.